Jake LaMotta (born July 10, 1921), nicknamed “The Bronx Bull” and “The Raging Bull”, is an American retired professional boxer and former World Middleweight Champion. Sugar Ray Robinson (born Walker Smith Jr.; May 3, 1921 – April 12, 1989) was an American professional boxer. Frequently cited as the greatest boxer of all time, Robinson’s performances in the welterweight and middleweight divisions prompted sportswriters to create “pound for pound” rankings, where they compared fighters regardless of weight. He was inducted into the International Boxing Hall of Fame in 1990. These two legends fought 5 times, the final bout is known as: Saint Valentine’s Day Massacre. 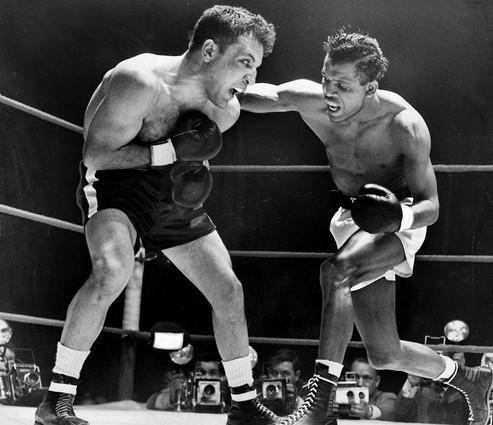 LaMotta was challenged by Sugar Ray Robinson for the final fight in their legendary six-bout rivalry. Held on February 14, 1951, Saint Valentine’s Day, the fight became known as boxing’s version of the Saint Valentine’s Day Massacre. In the last few rounds, LaMotta began to take a horrible beating and was soon unable to defend himself from Robinson’s powerful blows. But, in an amazing show of courage, LaMotta refused to go down. Robinson won by a technical knockout in the 13th round, when the fight was stopped with LaMotta lying on the ropes. However, Robinson was never able to knock LaMotta down. ← Best Trilogy. Gatti vs Ward, Pacquiao vs Marquez or Morales vs Barrera?